rather like a beating heart, the Earth changes shape systematically and repeatedly with each ‘Earthbeat’ taking 12 months. During the course of a single ‘beat,’ the northern hemisphere contracts, reaching a peak in February and March, at the same time as the southern hemisphere expands. This is followed byexpansion of the northern hemisphere, peaking in August and September, while the southern hemisphere goes into contraction. The scale of the changes involved is miniscule . . . the North Pole moves downwards by just 3 mm while points near the equator are pulled northwards by just half this amount. McGuire’s detailing of the many connections between geological forces, volcanic and tectonic events, and global climate and hydrological systems make for fascinating reading. If there’s an overall message to the book, it’s that the Earth is a delicately poised system of tectonic and biogeochemical forces that have historically alternated between relative stability and rather dramatic instability, and where the “stabilities” have themselves teetered between wildly varying forms. The most recent epoch, the Holocene (of the last 11,700 years), appears increasingly fated to be a brief post-glacial period of relative stability that has happened to be extremely conducive to the spread and flourishing of human cultures, but which is looking more precarious by the minute (or by the carbon part-per-million). Turns out that the Earth sciences seem to be suggesting that the capricious and fragile interpretations — i.e., those of the fatalists and the egalitarians, respectively (with environmentalists generally found among the latter) — may be empirically on the more correct track. interesting science, how does “capricious and fragile interpretations” equate with egalitarian? They make a fairly convoluted argument, the details of which I don’t remember. But I think it goes something like this: that environmentalists tend to be people who organize small, voluntary groups (think of green-up days, etc. 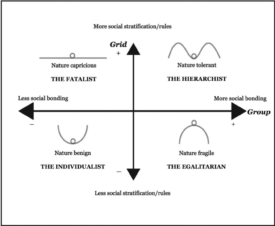 ), which by their nature are egalitarian and collectivist (or what Douglas calls “low grid” and “high group”), and lean towards sectarianism (which is why there are so many different environmental groups). Their goals are to keep human activities within a certain spectrum of what’s allowable (vis-a-vis the natural world). In comparison, the libertarian alternative (total, anything-goes freedom) is seen as risky, because if we allow anyone to do anything, we’ll screw things up (which is why we need those voluntary groups). And on the other side, governments (or other traditional, hierarchic institutions) can’t be trusted to ensure that things go smoothly either (if they could, we wouldn’t have to worry or organize… so we wouldn’t be environmentalists, by definition). Environmentalists therefore have an idea of nature being fragile and easily disrupted; if we don’t stay within a certain realm of allowable behavior, we can mess things up, and we can’t rely on traditional institutions to do anything about it. As for “capricious” nature, that’s a little different, and tends to lead to fatalism. You find some of that among people who are aware of environmental goals but don’t get active, because they don’t see activism as worth its while. RNW is the former Radio Netherlands Worldwide or Wereldomroep, which was founded as the Dutch international public broadcaster in 1947. In 2011, the Dutch government decided to cut funding and shift RNW from the ministry of Education, Culture and Science to the ministry of Foreign Affairs. interesting but how it works?